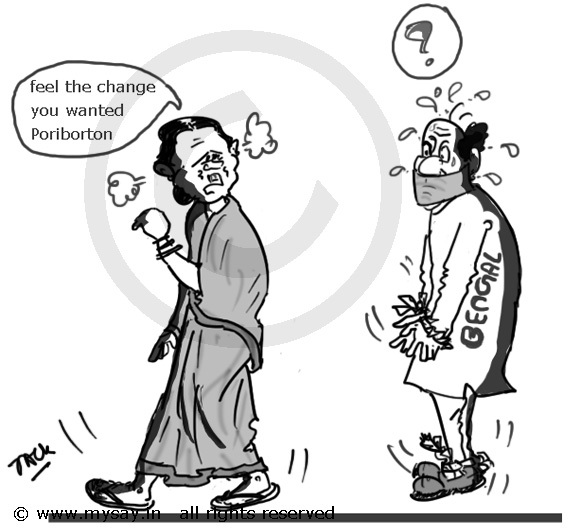 A chemistry professor from Jadavpur University,Kolkata has been booked by cops, accused for anti-Mamata Banerjee cartoon. The cops are of the view that respectable political figures were being shown in poor light-(Mamata Banerjee,Mukul Roy and Dinesh Trivedi). Ambikesh Mahapatra is accused of mailing a cartoon, made by him using pictures (face) of the above mentioned political leaders and typing dialogues,mimicking Satyajit Ray’s movie Sonar Kella to around 65 people in his list and later among uncounted people on the net. While returning back home in Garia , the professor was attacked by TMC supporters and meanwhile the police intervened and booked him. Although, neither the cartoon uses any wrong language nor does it looks vulgar or showing any politician in ‘poor-light’, it has been brought to limelight. Follow Detailed News and the Trouble – Cartoon! Is this what Change was all about ? Media , opposition and now even the coomon man…no one is spared ! So if in Bengal, better accept the (Change)’Porivorton’ and behave like an obidiant citizen,listening to your praents – the Government!